Easy-to-install with the transmission in the vehicle. 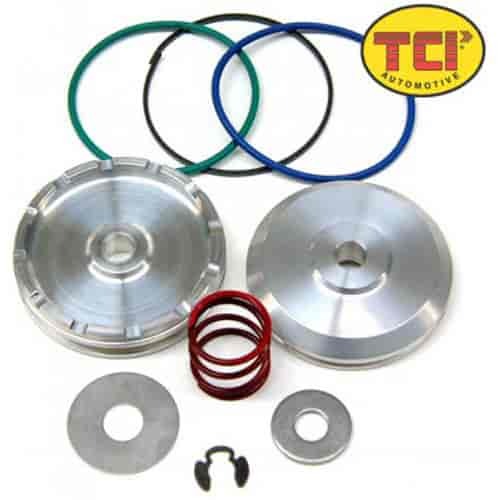 The innovative design of TCI's Transmission Servo Kits prevents the annoying downshift ''clunk'' that is common with aftermarket performance servo kits. Each kit is engineered to play a vital role in the operation of your transmission by providing a flex band connection that activates gear selection and action. Anchored to the transmission case and connected to the servos, Flex bands along with hydraulic transmission fluid activate these bands. When the servo mechanisms fill with hydraulic transmission fluid, in response to torque converter pressure, a the servos apply force against the bands to lock them into place around the transmission drums. While this happens, the flex bands allow gear action by forming a link between the transmission axle shaft and the transmission gears. As the fluid flows out of the servos, the bands are disengaged and the entire process is reversed. TCI offers transmission servo kits in your choice of billet, intermediate and jumbo styles for use in in a variety of applications. TCI makes replacement servo pins (sold separately) for use with TCI servo kits. Does TCI 376005 fit your vehicle?